عزیزی, امیر, اسماعیلی, سودابه, دهقان منشادی, سید مسعود. (1396). بررسی ارتباط اعتیاد به اینترنت با اضطراب و افسردگی در دانشآموزان دبیرستانی شهرستان جلفا در سال 1392. سلامت جامعه, 10(1), 11-18. امیر عزیزی; سودابه اسماعیلی; سید مسعود دهقان منشادی. "بررسی ارتباط اعتیاد به اینترنت با اضطراب و افسردگی در دانشآموزان دبیرستانی شهرستان جلفا در سال 1392". سلامت جامعه, 10, 1, 1396, 11-18. 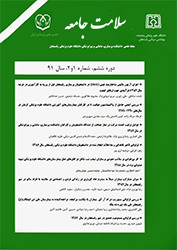 عزیزی, امیر, اسماعیلی, سودابه, دهقان منشادی, سید مسعود. (1396). 'بررسی ارتباط اعتیاد به اینترنت با اضطراب و افسردگی در دانشآموزان دبیرستانی شهرستان جلفا در سال 1392', سلامت جامعه, 10(1), pp. 11-18. عزیزی, امیر, اسماعیلی, سودابه, دهقان منشادی, سید مسعود. بررسی ارتباط اعتیاد به اینترنت با اضطراب و افسردگی در دانشآموزان دبیرستانی شهرستان جلفا در سال 1392. سلامت جامعه, 1396; 10(1): 11-18. مقدمه: با توجه به اینکه مطالعات قبلی ارتباط بین اعتیاد به اینترنت و مشکلات سلامت روانی را برجسته ساخته‌اند؛ هدف پژوهش حاضر بررسی رابطه ارتباط اعتیاد به اینترنت با اضطراب و افسردگی در دانش­آموزان دبیرستانی شهرستان جلفا بود. مواد و روش‌ها: پژوهش حاضر از نوع توصیفی بود که به روش همبستگی انجام شد. جامعه آماری این پژوهش کلیه دانش‍آموزان شهر جلفا در سال 1392 بودند که با روش نمونه‌گیری خوشه‌ای تعداد 150 نفر انتخاب شدند. جهت جمع‌آوری اطلاعات از مقیاس افسردگی و اضطراب بیمارستانی زیگموند و پرسشنامه اعتیاد به اینترنت یانگ استفاده شد. داده‌ها با استفاده از روش‌های آماری توصیفی شامل میانگین و انحراف معیار و روش‌های آماری استنباطی شامل ضریب همبستگی پیرسون و تحلیل رگرسیون، مورد تجزیه و تحلیل قرار گرفتند. یافته‌ها: براساس یافته‌ها، اضطراب و افسردگی با اعتیاد به اینترنت رابطه دارد؛ در تحلیل رگرسیون نیز مشخص شد که اضطراب و افسردگی حدود 63 درصد واریانس مربوط به اعتیاد به اینترنت را تبیین می‌کند. نتیجه‌گیری: با توجه به اینکه اعتیاد به اینترنت از طریق اضطراب و افسردگی قابل تبیین است؛ لذا نتایج این پژوهش تلویحات مهمی در زمینه آموزش دانش‍آموزان مبتلا به اعتیاد به اینترنت و مداخلات درمانی برای کنترل اضطراب و افسردگی آن‌ها به همراه دارد. 11-Ph.D Student of General Psychology, Lorestan University, Khorramabad, Iran. 2MSc in General Psychology, Islamic Azad University, Tabriz. Iran. Introduction: Given that previous studies of the relationship between Internet addiction and mental health problems have been highlighted; this study aimed to investigate the relationship between anxiety, depression and internet addiction in Jolfa city high school students. Material and Methods: This descriptive and co relational study was conducted on all the students in Julfa in 2013 and 150 students were selected by cluster sampling. Data were collected using hospital anxiety and depression scale of Zigmond and Young's Internet Addiction Test. The internal reliability of the Hospital Anxiety and Depression Scale questionnaire and Internet Addiction Scale based on alpha were estimated to be as 0.79, 0.91 respectively. Descriptive statistics such as mean and standard deviation and inferential statistical methods including correlation coefficient and regression analysis were analyzed and all steps were calculated using SPSS version 20. Result: According to the results, anxiety and depression are associated with Internet addiction. The regression analysis showed that about 63% of the variance of anxiety and depression could be related to Internet addiction. Conclusion: Given that Internet addiction can be explained by anxiety and depression, the results of this study have important implications for education of students with Internet addiction and treatment for anxiety and depression associated with them. Lin SS, Tsai CC. Sensation seeking and internet dependence of Taiwanese high school adolescents. Computers in human behavior 2002; 18(4):411-26. Ryu EJ, Choi KS, Seo JS, Nam BW. The relationships of Internet addiction, depression, and suicidal ideation in adolescents. Taehan Kanho Hakhoe Chi 2004; 34(1):102-10. Ko CH, Yen JY, Yen CF, Chen CS, Wang SY. The association between Internet addiction and belief of frustration intolerance: the gender difference. Cyberpsychology & Behavior 2008; 11(3):273-78. Holden C. Behavioral'addictions: do they exist? Science 2001; 294(5544):980-82. Fallah Mehneh T. editor Disorder of internet addiction. PsI 2007; 1: 26-31. Fitzpatrick JJ. Internet addiction: recognition and interventions. Archives of psychiatric nursing 2008; 22(2):59-60. Watson D, Tellegen A. Toward a consensual structure of mood. Psychological bulletin 1985 ;98(2):219-35. Wan CS, Chiou WB. Psychological motives and online games addiction: Atest of flow theory and humanistic needs theory for taiwanese adolescents. CyberPsychology & Behavior 2006; 9(3):317-24. LaRose R, Lin CA, Eastin MS. Unregulated Internet usage: Addiction, habit or deficient self-regulation? Media Psychology 2003; 5(3):225-53. Zigmond AS, Snaith RP. The hospital anxiety and depression scale. Acta psychiatrica scandinavica 1983; 67(6):361-70. Kim K, Ryu E, Chon MY, Yeun EJ, Choi SY, Seo JS and et al. Internet addiction in Korean adolescents and its relation to depression and suicidal ideation: a questionnaire survey. International journal of nursing studies 2006; 43(2):185-92. Young KS. Internet addiction: The emergence of a new clinical disorder. CyberPsychology & Behavior 1998; 1(3):237-44. Ko CH, Yen JY, Yen CF, Chen CS, Chen CC. The association between Internet addiction and psychiatric disorder: a review of the literature. European Psychiatry 2012; 27(1):1-8. Yen JY, Ko CH, Yen CF, Chen SH, Chung WL, Chen CC. Psychiatric symptoms in adolescents with Internet addiction: Comparison with substance use. Psychiatry and clinical neurosciences 2008; 62(1):9-16.